Updated 03/01/14 in response to a reader’s email to Karen Hudes, asking for clarification. See more in the comments below. 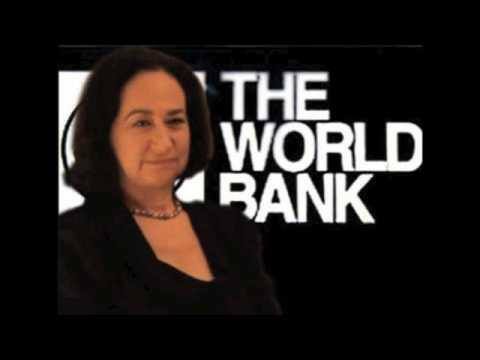 Thanks to Red Ice Radio for conducting this February 21, 2014 interview with Karen Hudes, confirming my suspicions about her since late 2013, when she claimed that the Jesuits were behind the corruption at the World Bank, and by extension, the international banking system. This despite the last three World Bank presidents being Robert Zoellick, Paul Wolfowitz and James Wolfensohn, and the latest three Federal Reserve Bank chairs being Janet Yellen, Ben Bernanke and Alan Greenspan — none of whom are Jesuits. Another alarm bell went off for me when she advocated giving back IMF gold to the member countries, so they could use it to back up their currencies. This is the pattern of the international banksters since the 1700s, in going to some gold-backed currency in order to boost confidence in it, with the full intention of removing the gold backing until usury has run its inevitable course and devalued the currency. It’s no coincidence, therefore, that former World Bank President, Robert Zoellick, called for some sort of gold linkage for currencies. Then, with this interview, she’s claiming aliens are behind the Jesuits. Sorry — it’s too much — and I now have to blow the whistle on her. For a fact-based, wide-ranging discussion of real economics, see my Red Ice Radio interview here. 1h20m – Said Hitler was related to Japanese emperor, etc.